annsmarty on Tue, 2013-04-02 13:59. ... Use "add link" button. 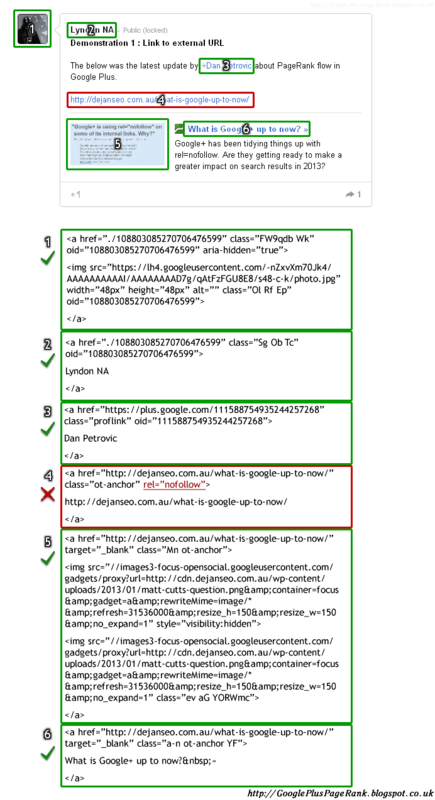 It's been noticed that Google Plus nofollows a lot of links except for those "attached" and also some links in the comments (that's the link with an interesting class as well: "class="a-n ot-anchor YF""). It's unclear if it's an oversight or if it's on purpose but that's the way it's done now: When you just paste the link in the update body, it gets nofollowed. It must be a good sign Google is mildly pointing us to the "proper" way to share links. Update: Here's a great article on Google Plus PageRank flow with the cheatsheet! Did Google point that out? DocSheldon on Tue, 2013-04-02 14:02. Ann, did someone at Google point out that difference, or one of our own just discovered it? chris-boggs on Thu, 2013-04-04 10:31.
annsmarty on Tue, 2013-04-02 14:22.
annsmarty on Thu, 2013-04-04 10:49. I did link to my source ;) I always do! chris-boggs on Thu, 2013-04-04 12:31. I wasn;t suggesting you didn't cite...I saw yours before I posted this and noticed it was from way back in January.